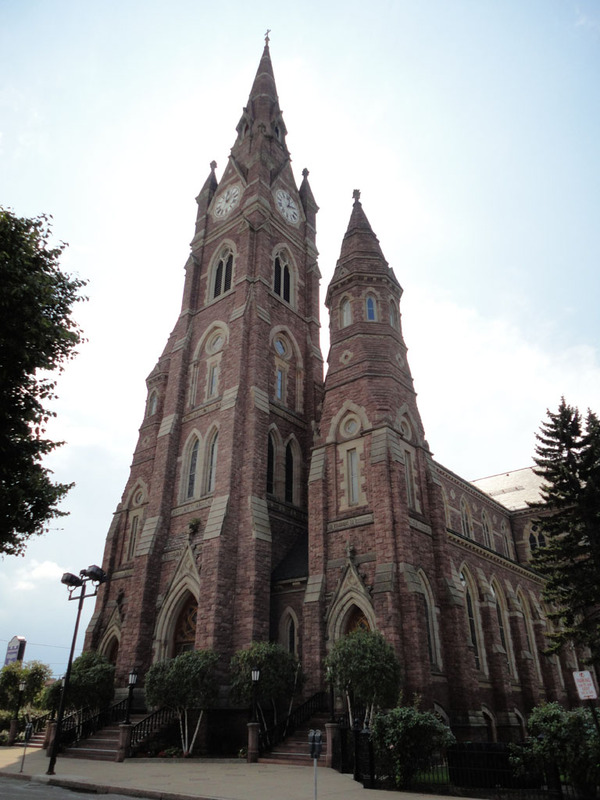 The Catholic diocese of Erie was created in 1853, with old Saint Patrick’s on East Fourth Street, as the Pro Cathedral. In 1873, construction on Saint Peter Cathedral began at the initiative of Bishop Tobias Mullen, third bishop of Erie. The architect was Patrick Keely of Brooklyn, who in his career designed 21 American Cathedrals and more than 600 churches in the Eastern United States. The style is Gothic in the French Victorian tradition. It was built between the years 1873 and 1893. Construction began with $9,000, with some $250,000 more raised by gifts and the efforts of Catholics in the thirteen counties of the diocese. The exterior is fashioned of red sandstone from New York State and white trim from Mercer County, Pennsylvania. The central tower, still dominant in the Erie skyline, stands 265 feet tall. The twin Norman style towers are 150 feet high. The central tower contains a chime of twelve bells cast in 1903 by the Meneeley foundry which weigh a total of fourteen tons. The Howard clock was installed in the same year. The stained glass windows of the Cathedral came in two eras: the sanctuary and the transept windows from the Franz Meer firm in Munich include depictions of the Annunciation, the Birth of Jesus, the Crucifixion, Resurrection, Ascension, and Second Coming. The large side windows show the Conferral of Keys to Saint Peter and Jesus’ supper at the house of the Publican. There are also stained glass windows of the life of St. Peter and four of the Western Doctors of the Church. These were among the first windows installed. All of the stained glass in the Cathedral was reset in 1992 – 1993 and many glass prisms were installed to highlight the interior by sunlight. The Cathedral Organ, built by the Montreal firm of Freres Casavant was installed here in 1977 with additions made in 1999. It is the third instrument in the building’s history and contains a great variety of organ voices in the French tradition. After passing through the main portal, one enters the nave of the church and can see the recently acquired likenesses of the nine bishops of the diocese and the Auxiliary Bishop Edward P. McManaman who served also as Cathedral Rector from 1936 to 1948. The new baptistery area with the holy oils and the paschal candle recalls the entry of all the followers of the Lord into the mystery of Christian life. The center aisle is of Spanish and Italian marble. Carved onto the marble at the front of the church is the large seal to the Diocese of Erie with the coats of arms of Pope Leo XIII and Bishop Mullen on the right and those of Pope John Paul II and Bishop Trautman on the left. The sanctuary area contains the altar with the reliquary chest beneath it, and the Bishop’s cathedra or chair of teaching authority and the ambo for the proclamation and preaching of the Word of God. The Blessed Sacrament is reserved in the tabernacle on the north side of the Cathedral. The 1911 marble altar at the rear of the sanctuary stands in quiet dignity and memory of its use until the liturgical restoration of Vatican II in the 1960’s. Deemed as “Mullen’s Folly” by the local media during its building, the Cathedral has endured arson fires, harsh weather, and over a century of change but still remains the Mother Church of Northwest Pennsylvania Roman Catholic Diocese. Bishop Mullen’s dream has served the Diocese of Erie to the present day as a focal point of Catholic life.